Another consideration is the type of funeral you would like. This is a highly personal decision and offers a chance to celebrate the unique qualities of the deceased. One of the first aspects to be decided is whether the funeral is to be a burial or cremation, and where and when you would like it to be held. The Revel Funeral service can help with these arrangements and make all enquiries and confirm all arrangements. Most people are buried ‘laid to rest’ in a churchyard or cemetery. When considering a burial some people usually already have an existing family grave, we will need to see the exclusive right of burial (known as the deeds) to assist in the arrangements. There will be a fee for reopening an existing grave. The cost of a new grave/plot will vary enormously across the country; you buy the exclusive right of burial. Cremations is not usually as expensive as a burial, this enables you to keep the cremated remains, allowing you more chose after the funeral for a subsequent memorial event. When choosing a cremation you can opt to have a church service followed by a short committal at the crematorium or you can have a service at the crematorium. You may wish not to have a service at all. What Happens to the Cremated Remains; we will explain all options, enabling you to decide what you would like to do. Revel Funeral Service will collect and hold the cremated remains until you are ready to collect them in person. Today most cemeteries and crematoria offer the facilities of small graves that can be purchased solely for cremated remains. 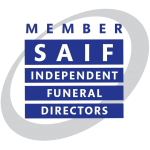 For more information on burials and cremation please contact your local crematoria or alternatively click on the links below.